November 15, 2004, Cape Town, South Africa — Edgars in association with the SABC’s three commercial radio stations – 5fm, Metro FM and Good Hope FM -brings one of the biggest music acts to South Africa! The two concerts, in Johannesburg and Cape Town, are being produced by Real Concerts and 206 Productions, in association with the U.S based Thirty-Three Productions. South African audiences have a lot to look forward to when the Black Eyed Peas hit our shores. They’ll be jetting into SA on the 19th November after performing at one of the world’s most prestigious music events, the MTV Europe Music Awards! And hopefully, along with the love, they’ll be clutching one or two (or even three) MTV AWARDS under their arms, having being nominated in 3 categories – BEST POP, BEST GROUP and BEST ALBUM for ELEPHUNK. Other artists in these categories include Anastacia, Avril Lavigne, Britney Spears, Robbie Williams (BEST POP), Beastie Boys, D12, Maroon 5, Outkast (BEST GROUP), Beyonce, Dido, Outkast and Usher (BEST ALBUM)! The Black Eyed Peas, with their inventive approach to hip-hop music have inspired people with loose rhymes, a positive spirit and a funkafied vibe! They’ve earned fans worldwide and their album ELEPHUNK has reached multi-platinum status in 17 countries worldwide with the help of a string of top 10 U.S. singles including “Where is the Love?”, “Hey Mama”, and “Let’s Get It Started”. The band’s much anticipated 4th album “Monkey Business” is due for release in early 2005. 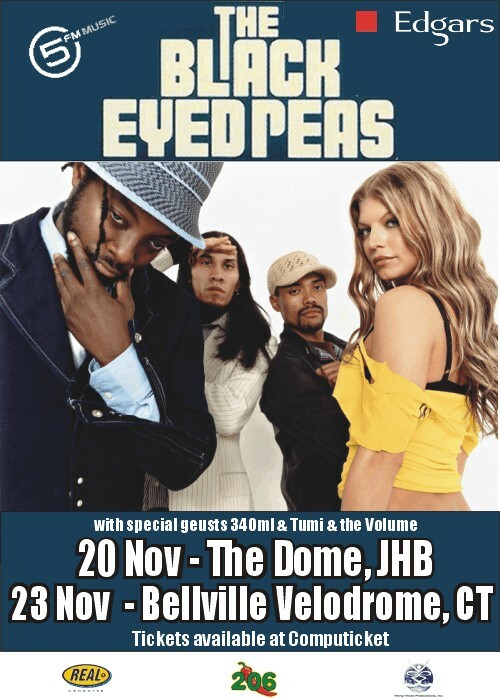 Catch the Black Eyed Peas in Jo’Burg at The Dome on the 20th November and in Cape Town at The Belville Velodrome on the 23rd November! Get your tickets now – from R250 to R320 (these prices exclude service fee). Bookings through Computicket on 083 915 8000 or visit their website at www.computicket.com for more information! BLACK EYED PEAS proudly brought to you by Edgars in association with SABC Commercial Radio Stations – 5fm, Metro FM and Good Hope FM.